RCI recently welcomed three new affiliated resorts in China to its vacation exchange network. The properties are Shangshanqi Villa Resort and Taoyuan Hot Spring International Hotel in Chengdu, Sichuan Province, and Bo’ao Holliyard Seaview Resort in Hainan Island. The signing of these agreements expands RCI’s portfolio of resorts in China to more than 55 properties. Shangshanqi Villa Resort is located at the foot of Qingcheng Mountain, a UNESCO World Heritage site. Qingcheng Mountain has been an important Taoist site for centuries, as it is believed to be one of the birth places of Taoism, China’s only indigenous religion. Besides the panoramic scenery the mountain offers, many popular attractions are easily accessible from the resort, such as the Jianfu Palace, Moon City Lake, ancient Taoist and Buddhist temples and other historical relics. The resort comprises 760 villas, and all units come with a living room and a full kitchen. It is 40 minutes away from Shuangliu International Airport via high speed rail, and an hour away via shuttle bus. Taoyuan Hot Spring International Hotel is located 57km west of Chengdu Dayi Heming Taoist Cultural scenic site, near the entrance of Qingcheng Mountain. The hotel’s architecture and décor are strongly influenced by Taoism, in honor of the religion’s birth place. Its exterior resembles a traditional Taoist temple, with a yin yang bagua – a design associated with Taoism – prominently featured on the ceiling of the hotel lobby, and subtly integrated throughout the hotel premises. 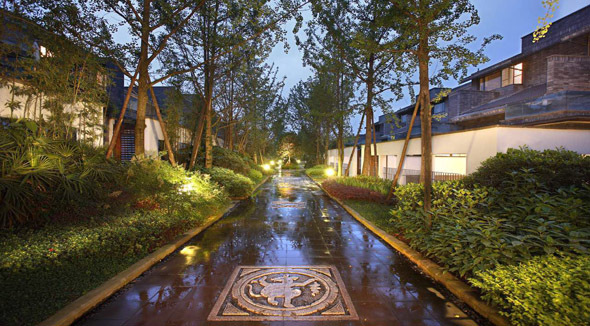 Opened in 2010, the hotel is an hour’s drive away from Shuangliu International Airport and has a total of 132 guestrooms. It is popular for its numerous indoor and outdoor hot spring pools, and its proximity to tourist attractions such as golf courses, ski fields and cultural sites. Boao Holliyard Seaview Resort is located in the tourism area of Qionghai, east of Hainan Island and 90 kilometers from Haikou Airport. The town is famous for the Boao Forum for Asia, a platform for dialogues among Asian government officials, business leaders and experts to promote economic exchange and corporation. The annual conference is held at Boao every year. The resort has 384 luxurious sea view rooms spread over 18 floors, offering a scenic view of the nearby mountains and the sea of Boao. Each room is exquisitely furnished with a modern design and all the amenities needed for a comfortable stay, including complimentary wireless internet access. The hotel offers an excellent variety of recreational facilities, such as indoor and outdoor swimming pools, a sauna, a fitness centre and a full-service spa. It is a 15-minute drive from Boao Golf and Country Club and Qionghai Boao Oriental Culture Garden.